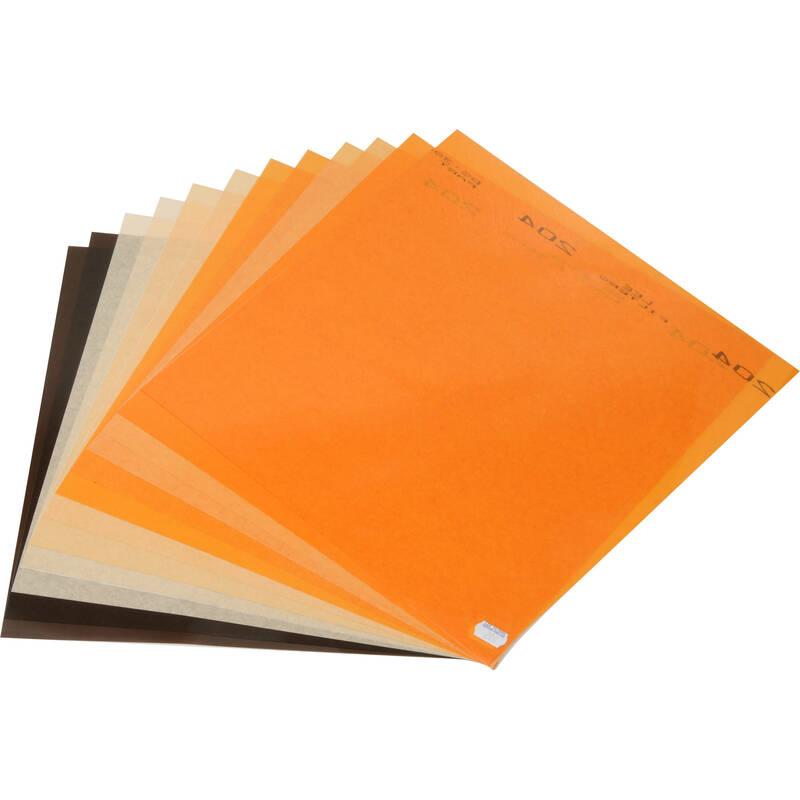 The Lee Daylight to Tungsten Filter Lighting Pack contains a complete assortment of 10 x 12" precut sheets of lighting filters. Known as C.T.O. 's, this kit contains grades of 6500K base conversion from 1/8 to one full grade, plus a combo full C.T.O. + 0.6 ND. Box Dimensions (LxWxH) 13.0 x 10.787 x 0.236"
Daylight to Tungsten Filter Lighting Pack, 12 Sheets (10 x 12") is rated 4.9 out of 5 by 39. Rated 5 out of 5 by JMKarlo from Lighting Filters for Special Effects I'm always having an idea how to create a more dramatic lighting effect on my subjects. These days by using battery powered LED lighting and these colored filters I can place them off camera to create that warm glow on subjects. The price is excellent for the amount of material I received. Rated 5 out of 5 by Anonymous from Better than I expected I installed under-cabinet fluourescent lights in the kitchen, and the 3000K color was too white. The lighting pack came with many shades of gels, so I was able to get exactly the warmth that I was looking for. I cut strips and placed them in the plastic light covers. Worked perfectly, and 2 sheets did the job. Excellent product, and just the right amount. Rated 5 out of 5 by Lt Dan from Awesome for warming up LED lighting!!! I recently redid my kitchen and installed undercounter LED lighting with a color temperature around 2900 K. Although considered warm white it did not match the overhead incandescent fixtures and looked wrong. I used these filters to warm up the color temperature and now the LEDs are nearly indistinguishable from the overhead incandescents. Very happy! Rated 5 out of 5 by jbphoto808 from Happiness is a warm filter Nice package of essential warming gels. Good value. Rated 5 out of 5 by Mark from Lee gels are great! I cut these gels for multiple flash setups used in photographing residential interiors. Lee gels are thicker and find them easier to use. The Lee swatch app can be used to calculate color temps, worth it; so not to bother with converting back to gels made by others. I have ordered the Zircon line as well for balancing with LED's and modern multi temp fluorescent fixtures. Rated 5 out of 5 by FLR from Great selection Needed the sheets to work with speedlight flash on location, great selection that goes to the very light 1/8 which is perfect for adding just a kick of warm color to faces while not stopping your flash power down. 2 sheets of each which is enough for a while. Can be cut in any size and adjusted to the flash units. can these be used to warm up par 38 led bright white floods? Trying to understand this right I've been referring daylight as about 5500K, which is the typical temperature for many moonlights. If the 1/8 CTO converts 6500K to 5500K, does this mean it'll convert my moonlight to 4500K since its rated at 5500K as standard output?